This post brought to you by Fellowes Brands. The content and opinions expressed below are that of While He Was Napping. I don’t know about you, but my house seems like it gets it hit by a bomb… or two… around this time of year. The kids bring home even more papers from school, stores are sending out sale papers, companies are doing their end-of-year policy updates, and we’re approaching a major election year so there’s all kinds of political mailers coming in as well. That’s a lot of paper coming through my front door. 1. Start now with all the new papers that come in your home. Once you get in the habit of getting rid of the stuff coming in, you can add a step or two here and there to get rid of the stuff already there. It’s so much easier to get rid of stuff a step at a time, rather than a big purge. Now, if you have the time for a big purge, then by all means. But, shy of burning my house down and just starting all over, I don’t have time to get rid of every single paper in one sitting. Besides, I’d much rather play with my cute boys than go through tedious piles of paperwork. When papers get brought into your house, go through them immediately. Take five minutes and just get it done. 2. I have two paper trays on my counter. Hey, it’s better than a stack of (unopened) mail! One for “things that need attention”, like bills, insurance things, a wedding announcement, coupons – if it has an expiration date or deadline. And one for “things to file”, like report cards, most DMV papers and other documentation, school papers or projects my kids bring home that I want to keep – if it is going to be kept long-term. Once a week, I clear out the trays. I deal with the stuff that needs attending and then file the things that are being kept where they belong. My filing boxes are a whole ‘nother story! The paper trays actually work really well for me. If having them in the kitchen doesn’t appeal to you, put them somewhere else. Maybe putting them in your office or something would work better for you. If so, I’m totally jealous you have an office! 3. Now, think of all that stuff you got rid of. Feels good to not have it cluttering your home, right? Some paperwork shouldn’t just be thrown out though. Even outdated paperwork can have sensitive information on it. That’s where a good shredder comes into play. 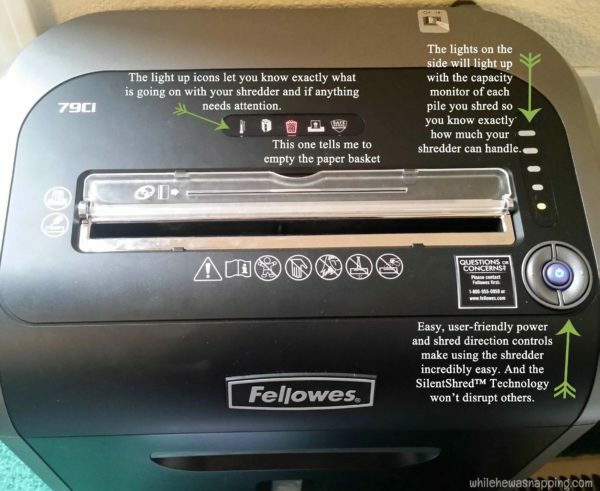 I have been using a Fellowes 79Ci shredder and I just love the sleek design and advanced technology. The SilentShred™ Technology lets me work on getting rid of our paper clutter during nap time without fear of waking the babies. Its patented 100% Jam Proof System is fantastic and has completely lived up to the promise in all the shredding I’ve done with it so far. The heavy-duty cross-cut blades can handle up to 16 pages at a time and you don’t have to take out staples or paper clips either, which is such a time saver. Another thing that I love is the extended 20 minute run time. I can get everything shredded all in one sitting and I don’t have to wait for the shredder to cool down. There’s also a cool little Energy Savings System feature that maximizes efficiency 100% of the time, both when you are actively using the shredder or when it’s in standby. If we ever get our bedroom office center set up like we want to, I will move this shredder in there and leave it on all the time. For now, it’s in our dining room and I unplug it after I use it, simply because I don’t want my kids to shred things! 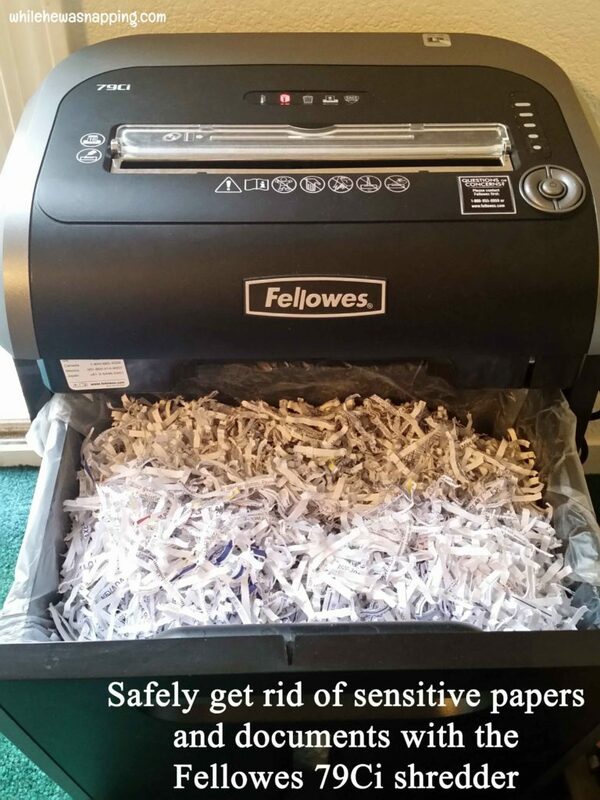 Which brings me to my absolute favorite feature: the patented SafeSense® Technology that automatically stops shredding when hands touch the paper opening so I don’t have to worry about little fingers. Obviously, you should still be cautious and not allow children to use the shredder but that safety feature allows me to feel confident in leaving it in our easily-accessible dining room. 4. 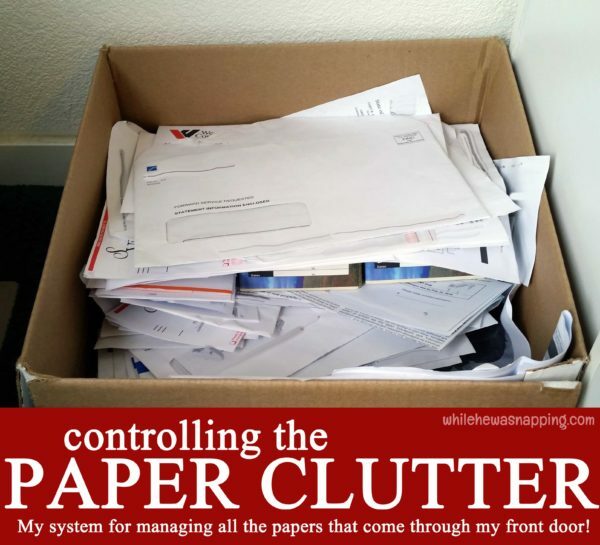 Now that you’re getting into the routine of getting rid of the paper before it piles up, what do you do about the already piled paper? Well, you have to go through it. But, here’s my trick to do it quickly: sort it out by type of paper. So, you have a pile of old mail: 3 pages from your insurance company, 2 medical bills, 3 utility bills, 2 credit card bills, some advertising pieces and a postcard from Grandpa and Grandma on vacation. First, pitch that advertising in the trash! Anything that is addressed to … ” or current resident” doesn’t need to take up your space. Make an exception for coupons, if that’s your thing, but that’s about all the exceptions I can think of. Second, separate the mail into the categories listed above: insurance documents, medical, utility, credit card and personal. You can stop there for now if you need to or keep going. Third, choose a pile and open up the main page. Depending on how much time I have, I try to start with the biggest pile. Get the worst done first. If it’s a bill that had already been paid, shred it. Your bank will have documentation of the payment and most companies have the option to look up your account online, including payment history. You don’t need the statement. If it had not been paid, it goes to the “needs attention” paper tray to be dealt with. If the paper is something medical, legal or otherwise needs to be kept, put it in the “to be filled” tray. If the paper is personal, decide whether you need to keep it or not. Something like a postcard from Dad or Grandpa and Grandma is something I will hang on the fridge for a while (like until they get back – not like months or years), share with my boys and then throw out. If it’s too sentimental, consider taking a photo of it and then discarding. You’ll have the photo to look back at later if you really want to. If you do keep it, file it away so it has a place. Don’t let it clutter. Keep working your way through the piles, one at a time. I find I usually add to my piles before I ever get them all gone through completely. I still find the occasional box of papers that need to be sorted, but it’s getting better. Mostly, I LOVE that my kitchen counters aren’t covered in old mail! 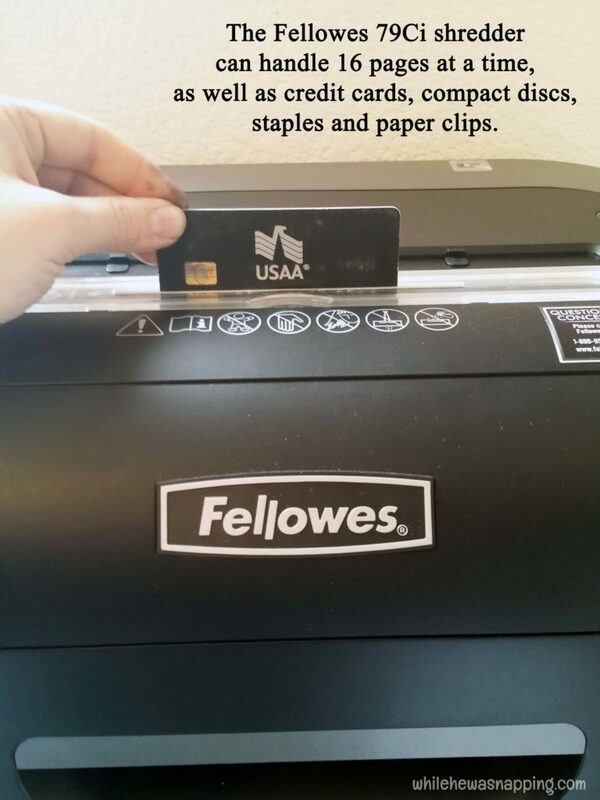 I love knowing or personal information is safely destroyed with the Fellowes 79Ci shredder so I don’t have to worry. The 79Ci is available at Amazon and Office Superstores with a suggested retail price of $239.99. 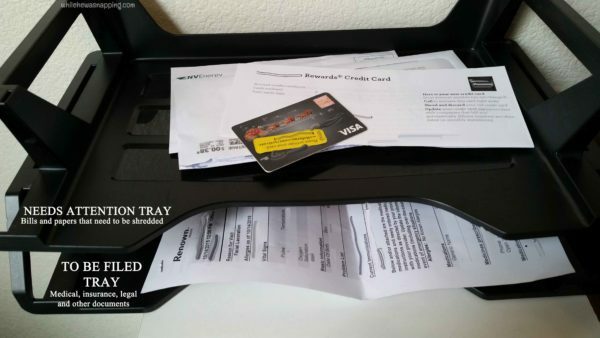 I love that I can use the shredder while my children are napping or when they are awake, I don’t have to plan getting rid of clutter papers that come into my home, I can just do it. This means I have more time to spend with my kids, doing festive holiday activities and that my house doesn’t look like a bomb went off. At least, not a paper bomb. We’re still working on a toy factory explosion problem. But that’s a whole different problem. Krista, I need to get that shredder. I have a good shredder, but it’s loud. I get up at 5:30 and like to work on my desk then, but need to be quiet. So glad to learn I’m not the only one with paper issues! If you can afford the Fellowes Ci79, I highly recommend it. It’s a little higher on the expensive end of shredders, but totally worth it. I’m not sure I would have initially bought it at that price point; but, having used one now, I would definitely consider getting another one if I needed two shredders. Ahhh I actually really need to buy a shredder, and I know i too.. *rolls eyes* I always used to borrow my mom’s, but we moved to a new state, sigh. Thank you for the reminder!! I love this shredder! While I’m not one to go out and spend quite that much on an office electronic like a shredder, if it’s in your budget, I would HIGHLY recommend it. So amazing – the 16 sheet thing is a such a time saver!